Mary Rogers was born in 1929 in Derbyshire and studied at Watford Art School, St Martin’s in London and ceramics at Loughborough School of Art, close to which she had set up her first pottery studio. 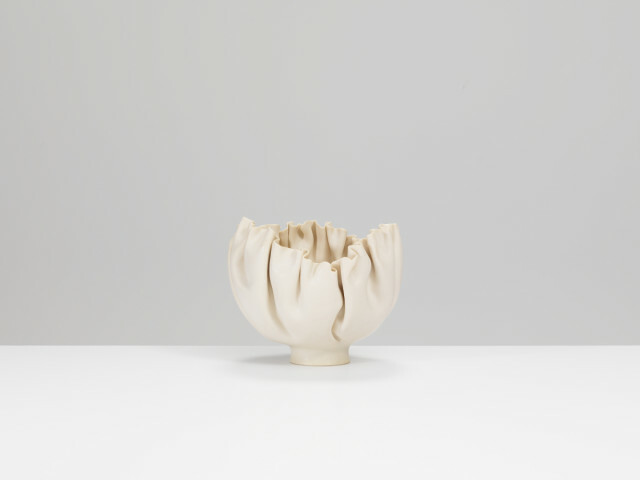 Rogers was one of the most admired of the generation of stoneware and porcelain hand-builders producing interesting work in the 1960s and 70s onwards, her delicate and ethereal coiled and pinched pieces expressive of organisms one might find on the sea bed or forest floor. Her ceramics, along with the comparable pieces of potters like Geoffrey Swindell, Peter Simpson and Deirdre Burnett, were a quietly sculptural foil to the sturdier qualities of the stoneware tablewares enjoying new popularity by the 70s, its crisp and luminous translucency surviving the test of time. She subsequently moved her studio to Cornwall, but retired from making in 1991.